are hybrid designs between mini-mals and shortboards. 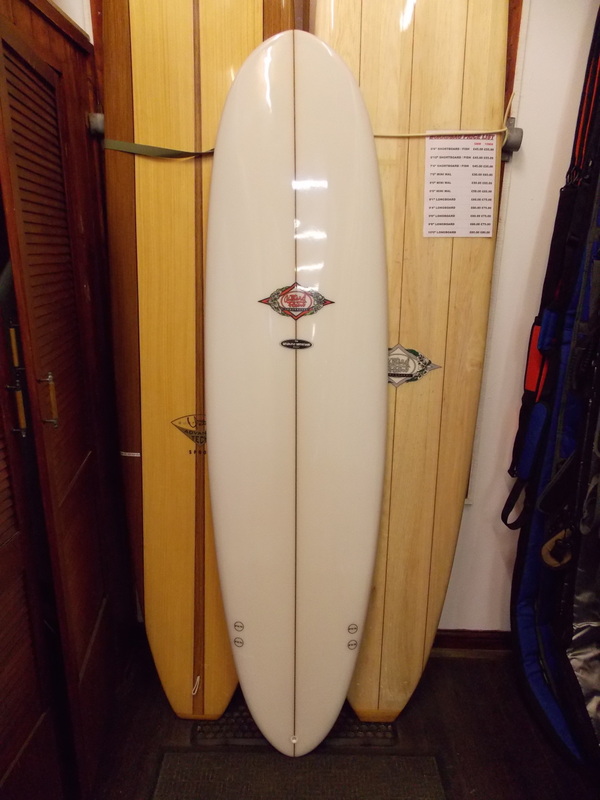 They have a much more progressive rocker and the rails have a lower profile, which makes these less stable and slightly more performance orientated and able to easy handle bigger surf. If you are not quite ready for a shortboard then this may be a great option. are bigger volume and geared to smaller conditions (up to head high) although often used in bigger surf. Easy paddling and stable. If you have been surfing 20 mins or 20 years, you will have a lot of fun on one of these. Mini mals can sometimes be wrongly labeled as beginner boards. These are not learner boards. A keen learner does not need a learner board as these boards will need to be upgraded very quickly when you soon outgrow its limitations. He/she needs suitable flotation. These have that flotation. We sell these to many wise, long time surfers, who understand the joy of foam, and rip on them!. Being 22 1/2" wide make these performance boards both stable and provide great flotation. The plan shape with the wider nose, width and round pin tail perfectly balances the requirement for tight turns and wave catching. The fin set up is a 10" fin box, inc 8" fiberglass fin with fcs sidebites. The fin box will allow a great degree of "self tuning" as you can change the position or the size of the fin which will change "projection" and "pivot", resulting in a more future proof board. This is just a selection of our mini-mals. We do have many other colours, stringer options & shapes in stock and we just cannot list them all. if possible, please come to the shop and view them. As with all our board range, please call to check availability before you make a purchase, as these can become out of stock very quickly. Our 'Famous' High Volume Mini Mal has been one of the best selling Custard Point boards over the last 30 years. All sizes from 7'2" x 22" x 3" up to 8' x 23" x 3"
A great high volume board that catches waves incredibly easily whilst still showing good maneuverability and hold in the wave face. A lot of 'Fun" in all wave types and ideal for beginner to intermediate surfers or as that small wave summer board for the advanced surfer.